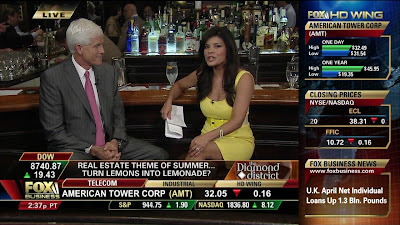 Rebecca Gomez is a business correspondent for Fox News Channel. She regularly appears on Your World with Neil Cavuto and the Cost of Freedom business block on Saturdays. In addition, she is a news anchor on the Fox Business Network, where she co-hosts Happy Hour with Cody Willard. Before joining Fox, she was a fill-in business and stock market reporter for CNN and Headline News. In addition Casone was a freelance reporter for CBS News. Prior to her freelance assignments Cheryl was a news update anchor for MSNBC and occasional anchor of MSNBC Live from July 2004 until September 2005. Casone has previously worked for ON24 as a business reporter covering international markets, KRON-TV in San Francisco as an anchor/reporter from February 2002 to July 2004, and for Bloomberg Television in New York City as a business reporter in January 2002.